Welkom bij The Cabin; een meest unieke binnenstad omgeving met eersteklas uitzicht op de stad en de bergen. Een rustieke berg retraite in het centrum van de stad! Geniet van een glas wijn terwijl u geniet van spectaculaire zonsondergangen vanaf uw leuke, authentieke blokhut met uitzicht op de skyline van Calgary. Ontspannen voor een luie middag op de veranda of verken de hippe wijken van Ramsay, Inglewood, Mission en Bridgeland, allemaal toegankelijk vanuit de Bow River Bicycle Pathways die voor de deur. De cabine is gunstig gelegen minuten naar de Calgary Zoo, Telus Sparks Science Center en Saddledome. Het is gewoon een wandeling langs de heuvel naar een van de meest opmerkelijke restaurants van Calgary, The Nash, en dicht bij vele andere fantastische culinaire pareltjes. Het stadscentrum en Prince's Island Park ligt op 20 minuten lopen. De woonkamer is super gezellig met een gas open haard, en de keuken biedt alle comfort met grote Nespresso koffie inbegrepen. De studio is voorzien van een echte loft met queen bed en luxe beddengoed en enkele dag bed op de belangrijkste niveau, in het geval u niet wilt beklimmen van de ladder. Eigen badkamer is voorzien van een kleine, maar efficiënte douche die eerste dag baden voorzieningen omvat. Wij bieden gratis wifi, parkeren en veel goede adviezen! 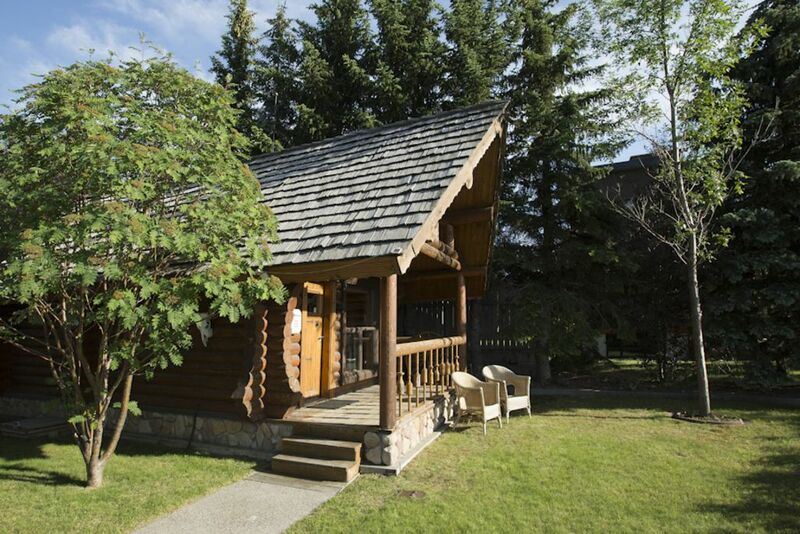 It was truly a pleasure to stay in a rustic log cabin in the heart of Calgary. Usually staying in a log cabin, you expect to see mountains and lakes views but thanks to the Young's family we had one of the best views of the city of Calgary, especially at night. The cabin was clean and very comfortable. The kitchen was fully equipped, and we had most of our meal there. Unfortunately the weather was not good (-1 C in September??) but despite that the cabin was comfortable and my wife and I had a good time with our dog Milou, a standard poodle. We had great walks in the parks near the house which made Milou stay very enjoyable. Overall, I highly recommend this unique rental house in the heart of Calgary. Enjoy the rest of your fall and stay warm this winter. This was our second time at the cabin and it was just as enjoyable as the first. Central, clean, well appointed with thoughtful touches and high-end features such as quality linens and toiletries, handy to groovy neighbourhoods and some major attractions as well as the C-train. It's cozy, perfect in all seasons and almost a destination in itself. We loved hanging out there and taking scenic little walks along the top of Scotchman's Hill just as much as seeing the sights. Thanks Robin! It was great to see you back, I hope Tabitha enjoyed her stay as well...nice to see the "girls night out" with her friend. Enjoy the remnants of summer, and I'm happy the Cabin provided another relaxing stay for you. Glad you enjoyed the sights and the road trips as well. All the best, I hope we'll see you back again next season! We loved our stay at the cabin! It’s close to downtown but in a beautiful and quiet neighbourhood. We enjoyed exploring Inglewood’s shops and restaurants. The cabin was comfortable and had everything we needed. We appreciated being able to bring our dog with us and for the many dog parks surrounding the property. We look forward to staying here again! Thank you Robert! Thank you Kaitlyn for joining us this weekend! I'm glad everything was to your satisfaction, and glad to hear the wedding went well! We're looking forward to seeing you again, and thank you for recommending it to people you talked to about your stay here with us. All the best for the rest of the summer, I'm glad your dog was in his "Happy Place"...! Wonderful cosy cabin with great views of Downtown! We had a fantastic stay at The Cabin. The owner was friendly and very welcoming. The Cabin is wonderfully situated close to Inglewood and Downtown and we very much enjoyed early evenings on the porch with drinks! We’d highly recommend to any couple looking for a peaceful and rustic stay - providing they don’t mind climbing a ladder to bed! Thank you so much Mary for the kind words. I'm glad you and Peter felt relaxed. It was nice to see a couple that took advantage of walking vs. a car to explore the surrounding aeas, and of course get some exercise. All the best for the rest of the summer, keep us in mind for your next trip overseas to Calgary. Cheers. We visited Calgary for a weekend during the Stampede this summer and absolutely LOVED our stay. The location is perfect - right up the hill with a great view of downtown and gorgeous sunsets. We were only a few steps from a view of the Stampede and probably one of the best spots in the city to see fireworks each night. The cabin itself was extremely clean and well maintained. There was tons of natural light from all the windows. And the ladder to get to the bed upstairs was just the coolest feature! Fridge was the perfect size, they had a coffee maker, brita filter, toaster oven - everything you need to feel right at home for just a few days!! Beds and couch were very comfy. The wifi was strong which was important as we had to work a day while visiting.Overall, this place is amazing. It was the perfect balance between feeling like you're at home with all the amenities, and being on vacation. Robert was very kind and accommodating. He came over as soon as we arrived to introduce himself and ask if we had any questions/concerns, and was readily available during our stay if we needed anything. Super friendly and welcoming. Beautiful property. Great location. We were so happy with our stay, hopefully we are able to get in next summer if we come back for the Stampede. Highly recommend!!! I really appreciate the comments, and I'm glad you found your Oasis away from home. It really is easy especially during Stampede ot be where we are considering it's proximity to the Stampede Grounds. Enjoy the rest of this beautiful summer and I hope to see you for Stampede 2019. This place was the perfect setting for our visit to Calgary. It was walking distance to a bunch of fun things to do, including the Calgary Stampede (which was a ton of fun!). The cabin is clean, well designed for the two of us, with all the amenities we needed. We cooked several meals and the sleeping arrangement is super comfy and fun! It's a great place to stay while visiting Calgary. Welcome back home, and thanks for the nice review! advantage of the "Greatest Outdoor Show on Earth"! happy duration to the summer. De meest unieke binnenstad omgeving met eersteklas uitzicht op de stad en de bergen. Uw schilderachtige blokhut, compleet met terras gelegen aan de rand van Scotsman's Hill op u wacht. Gunstig gelegen op 10 minuten loopafstand van Saddledome en Stampede Grounds, op 20 minuten lopen van het centrum van de stad; en stadsfiets paden liggen voor de deur. Gemakkelijke toegang tot de C-Train, Calgary Zoo, historische Inglewood, Fort Calgary en vele culinaire pareltjes.